You probably have a question mark on your face, until you realize that inflation is eating up the value of your money. Unless you have P1 million in your account, you’re only earning 0.25 percent in interest yearly versus the 4 percent inflation rate in the Philippines last 2014. Withdraw a portion of your money from your payroll account and put it into higher-yielding accounts such as time deposits or investment accounts. According to research from the National Endowment for Financial Education, roughly 70 percent of people who come into windfalls end up broke within seven years. This is because they aren’t used to managing a large sum. Before you spend your 13th month pay, plan how you’re going to use it. Set a specific percentage which will go to savings, investments, and debt payments among others. If you don’t have an emergency fund yet (roughly six months of living expenses), allocate a portion of your money to building one. This fund prepares you for unforeseen expenses such as emergency health costs, a sudden home repair, and even a job loss. Your retirement fund is different from your emergency fund. Where the latter protects you from unforeseen events in the near future, your retirement fund prepares you for the more long-term future. As mentioned a while ago, remove the money from low-yielding accounts such as your savings or checking account, and put it in higher-yielding accounts such as investments. There are many investments to choose from—mutual funds, unit investment trust funds (UITFs), stocks and real estate to name a few. Your choice will depend on your risk tolerance. Whether you’re investing in mutual funds or the stock market, you’re sure to beat the 0.25 percent inflation rate of savings and checking accounts. Speed up your debt payment timeline and use a part of your 13th month pay to pay your debts, be it credit card debt, personal loans, car monthly payments, or what have you. Remember that the interest rates on these debts are sky high—it’s 3.5 percent a month for late credit card payments —so use the small windfall to tackle high-interest debt. Your home may need a few repairs. For this, it’s best to resolve these sooner rather than later. Taking preventive rather than corrective measures may save you big bucks in the future. If you put off repairing a plumbing leak, you may end up spending big bucks when your flooring or walls are affected by the leak. Whether it’s your travel or shoe fund, you can set a portion of your 13th month pay to fund items or experiences you’ve been saving up for. If you love to save, you may have forgotten to treat yourself. You probably don’t remember the last time you went on a vacation or treated yourself to a nice dinner out. You deserve some relief from time to time, so set a portion to ramp up any ‘fun’ funds you have. Related to the above, it’s hard to penny pinch all the time. It’s important to prepare for your future, but it shouldn’t be at the expense or to the detriment of your present self. Decades down the road, when you’re reliving your younger years to your grandchildren or to your friends during your university’s 50th-year reunion, you don’t want to stand on the sidelines without anything to say. Once you’ve made sure you’ve saved up for your future self, treat your present self to something nice. To have an easier time managing your ‘fun’ money from your savings or retirement fund, have separate accounts depending on what you’ll use the money for. Last but definitely not the least, share your blessings with others. Whether it’s donating to your local church or a cause you feel strongly about, never forget to give back. This develops the core value of sharing wealth with others in need and teaches you to appreciate the material goods you have. It’s also a reminder of stewardship and that money is really the Lord’s—we are merely managers. There are many ways to use your 13th month pay. The bottom line is proper money management. Money is not a means to an end; it’s a vehicle for us to do what we want—whether it’s living a comfortable retirement or going on the vacation you’ve always dreamt of. 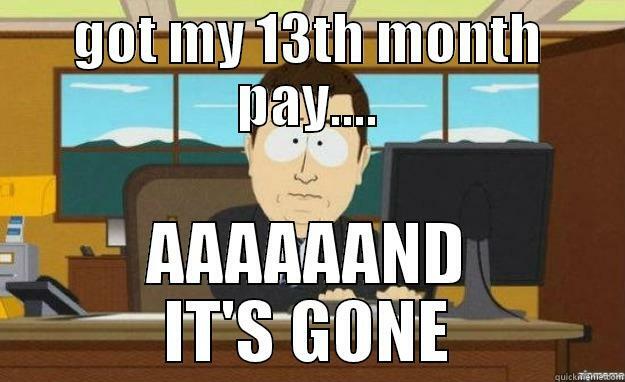 When you receive your 13th month pay, don’t spend it all in one go. Budget and plan it, and if you can, share it. When 13th pay or bonus came into the picture, i was teaching in a government-funded university or state university. The mid year (may 15) and the end year bonus were kept in the bank to be withdrawn in february to pay 3 vul accounts. I am now retired and those accts are still with earnings being accummulated. I also keep a certain few coinsin “alkancya” for christmas or summer vacation or hotel staycation for the whole family . I also have a bottle for coins which i used to shop in divisoria for gifts. I did shopping twice a year only – october and april of each year. Both were either done in divisoria or baclaran. October is before christmas and april is after graduation. I go to malls for things i considered emergency like immediate school needs of my kids like crayon, manila paper. Then the place is not crowded. I share these practices with friends. Many laugh at the practice but i still share it even with my clients till now. I do not know if it makes sense to financial planners like you. It helped the family to travel annually – december to the north and mindanao in summer. Sometimes we went to neighboring countries.